Apparently there is only one Sri Lankan restaurant in Prague and it’s right in our neighbourhood! Although they don’t actually label vegan options on the menu, they are a regular fixture at Prague’s vegan festivals and are always happy to confirm that all the meat-free options are vegan. The menu is pretty simple: curry, kottu roti, the devil’s speciality, and ‘from the wok’. 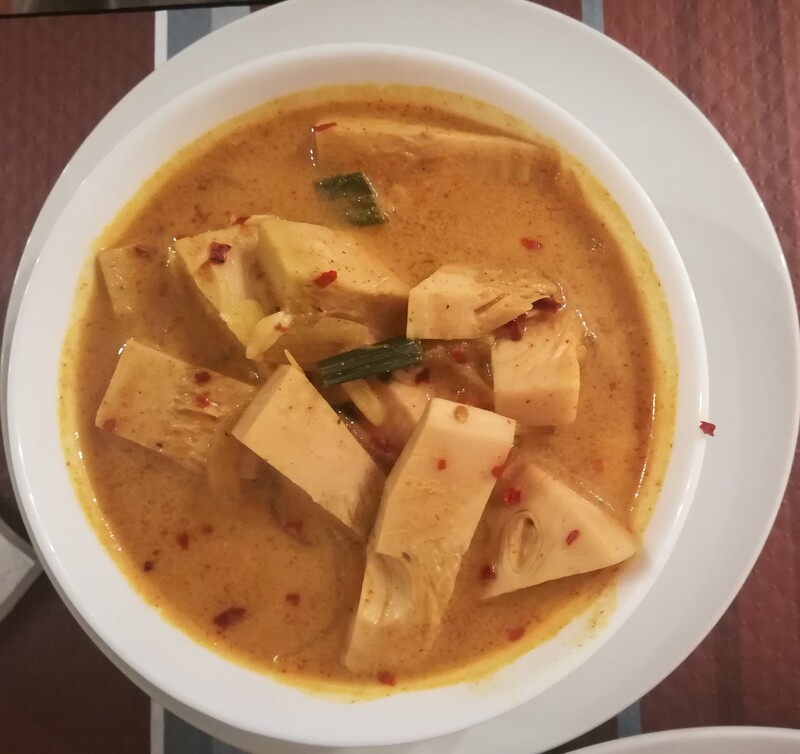 We always stick to the first two, because they can be served with jack fruit (for every dish, you need to choose your main element – there are various kinds of meat (bleurgh), or tasty vegan options like vegetables, soy meat, or jack fruit). Jack fruit hasn’t really taken off in Prague’s vegan scene like it has back home, so this is our go-to place if we want some. For every dish you also need to specify if you’d like it spicy, medium, or mild. Even Dr HH can’t handle the spicy version, so you might want to play it safe too. The curry is delicious! It is chock full of tender jack fruit, and really beautifully seasoned. Our only complaint is that the sauce is quite thin, and would probably be best served with rice to soak it up. But who wants to eat rice when there’s a heavenly garlic roti on the menu?! Even though we know that rice would work better, we order this without fail. 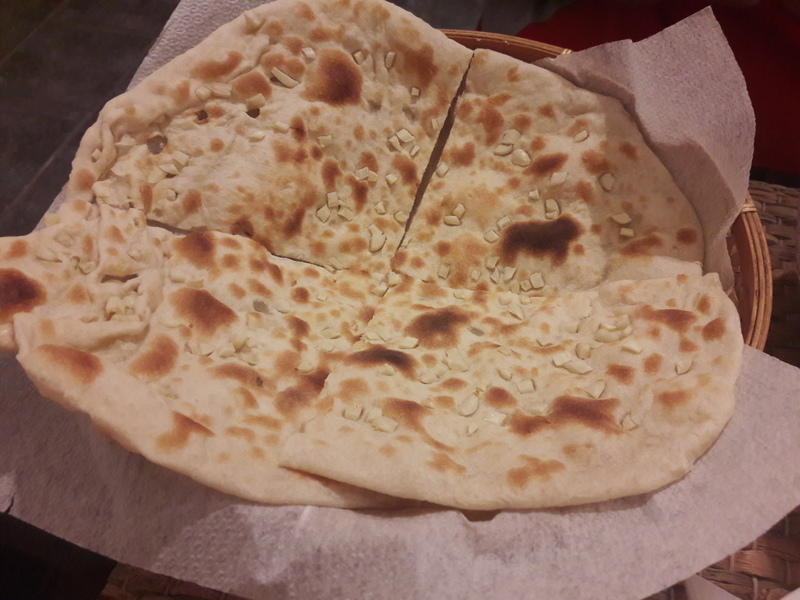 I would love to be the genius who first thought to combine garlic and bread – this is truly the kind of innovation that should be rewarded! 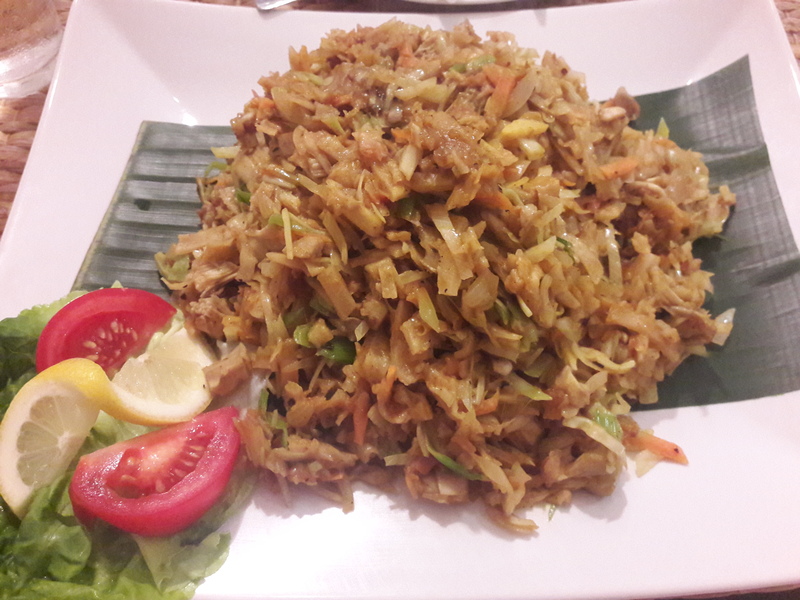 The other dish that we order, the jack fruit kottu roti, also features some roti – apparently this is a street food dish, with shredded jack fruit, strips of roti, and bits of veg all stir-fried together. I’d never heard of this dish before, and I can tell you that it’s sensational. The bread really makes it. 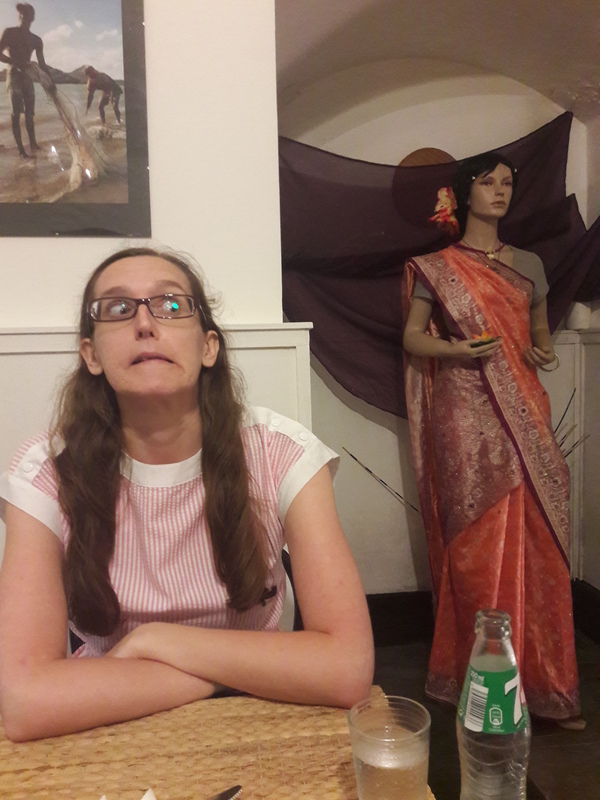 The only bad thing about the Sri Lankan Curry House (well, besides the fact that they serve meat) is this weird mannequin in the restaurant. It’s a basement restaurant, so it’s quite dark with no natural light, and there’s just something unsettling about a mannequin lurking behind you while you eat. Obviously I don’t let it put me off too much though! Have you ever seen anything creepier than this mannequin in a restaurant? This entry was posted in Travel, Vegan Mofo and tagged Sri Lankan Curry House Prague, vegan Prague, vegan Sri Lankan food, vegan travel, veganmofo18. Bookmark the permalink. To answer your question, no, I don’t think I’ve ever seen anything creepier in a restaurant! Yick! The food looks amazing! There’s a similar South Indian dish called kothu parotta, but it had milk in it the one time we came across it on a menu. I keep meaning to recreate it, and I loooove the idea of adding jackfruit to bulk it up! Good luck recreating it! It’s so delicious! I’ve only ever bought canned jackfruit, but I’m intrigued by it! The jack fruit kottu roti looks so good! How odd about the mannequin, haha! I would say the religious videos at Loving Hut. This is also coming from a lady who finds organized religions very problematic (but can be good for many people!) lol I love how the jackfruit is served in chunks instead of simply shredded. I guess that is more traditional? Oh yeah, those videos make me very uncomfortable! Fortunately the Loving Hut near my office is in the middle of a busy food hall and they don’t play any videos, so I can just enjoy the food!